Years ago, when our boys were very young, two of my dear friends and I would meet at one of our homes in mid-December and bake cookies. Gretchen and Linda are sisters (Linda was my Maid of Honor at my wedding) and the three of us have known each other since our days as Disneyland employees (just before automobiles were invented). Those years of cookie baking have created some of my fondest holiday memories and the recipes we used are still some of my favorites. I thought I’d share them with you all (all 5 of you!). 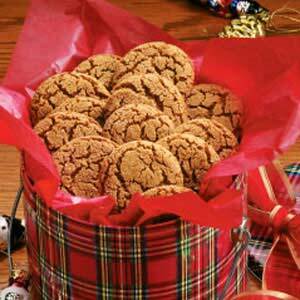 These cookies turn out every time and make a great gift. baking soda, flour, clove, and ginger, cinnamon and salt; mix well. 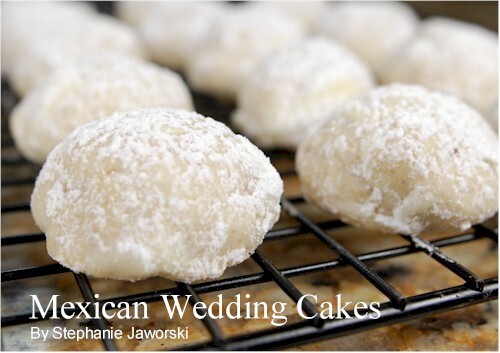 Form into 1 inch balls and roll in granulated sugar. Place on cookie sheets 2 inches apart and bake for 8 to 10 minutes in the preheated oven. Cool on a rack. 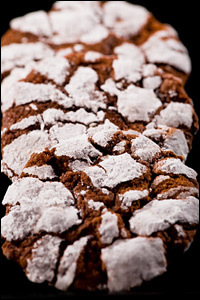 This cookie is just the right amount of chocolate and a little powdered sugar. In a medium bowl, blend the shortening, sugar and vanilla; beat in eggs and cocoa. Sift together flour, baking powder and salt and add to sugar mixture alternately with milk. Chill dough for 3 hours; form 1” balls, roll in powdered sugar. Place on greased cookies sheet and bake for 15 minutes. This may be my personal favorite of the 3 recipes. In a medium bowl, cream butter and sugar; add 2 teaspoons water and vanilla. Mix well. Blend in flour and nuts. Shape into balls and bake on ungreased cookie sheet at 325° about 20 minutes. Remove and roll in confectioners sugar while cookies are still warm. I’d love to hear about your favorite holiday cookie! Happy baking. By the way, these freeze if need be. Sometimes we have to plan ahead. YUMMMM! I want to make all of them. You have me in the baking mood. I might have to try these. They all sounds yummy. My favorite is still the peanut butter with the hersey’s kiss. My neighbor just moved but the last few years she made them and I’d silently sit by and eat them all as she boxed them up for friends. LOL, what an image, eating cookies meant to be given! 🙂 I remember that Hershey kiss recipe and it’s hubby’s favorite—he’s a huge chocolate/peanut butter fan. I may have to whip up a batch for the big guy. Thanks for reminding me of that one. I LOVE cookies and these look delish! Hope you’re enjoying the season…happy baking! These recipes are pretty easy if you feel the mood strike for some home baked goodness. You brought me to tears with all the fond remembrances on this blog. How I used to look forward to our Christmas cookie bakes. One of these years, we’ll do them again — before we all get too old to stand on our own! Thanks for a wonderful walk down memory lane! We did have fun, didn’t we? Hard to believe it was so many years ago.